After being a lurker of the LBE section for several years, finally I have a full bridge to my name. I basically hooked up the displays to the ports of my Radeon 7850, using one DVI ports for the 17" VGA Dispaly and the other for one of my refurbished displays. I could however not get my graphics board to drive more then three displays connected to the the DP-hub with DP to DVI adapters, so five stations of a single PC it is for now. Installation of the AsterV7 software was as simple as it gets: download the trial, install, configure hosts, run, cheer. 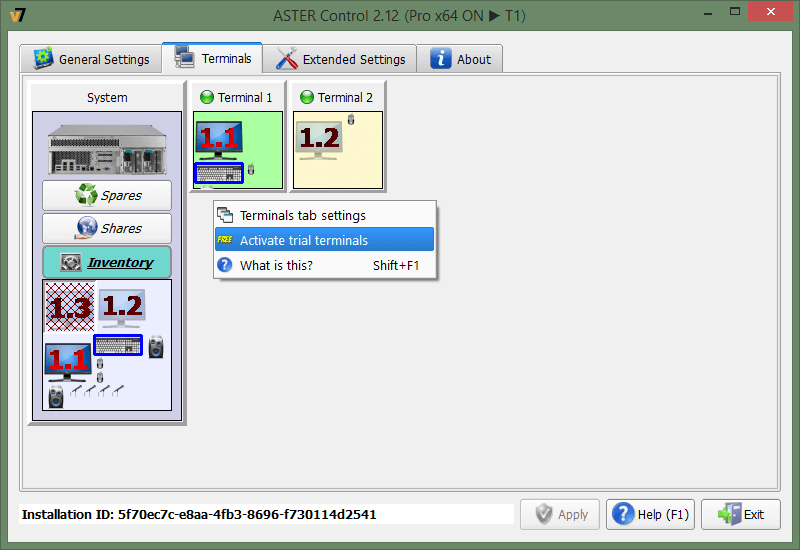 The Aster control programm just shows you what displays, keyboards and mice it detected and lets you drag and drop those between so called workplaces until you are satisfied. One issue I encountered was that my system doesn't like Aster's auto-logon feature. I needed to enable manual login to the user accounts of each workplace, otherwise not all workplace would activate their displays. My game configuration is to run the server and all five bridge stations from the bridge-in-the-box, with the server running in a background window on the central console and all station connect to localhost. This eliminates all the communication lag between Stations and server (which is good, I think). As described in the archtitecture section, I discovered my GPU seems to only support 5 screens simultaneously. After a bit of cursing, I fetched my notebook to drive the mainscreen, connected my bridge in a box with a crossover LAN cable. The next step I plan will be the addition of my DMX lights to the setup. I am looking forward to my New years Eve Party and hope to post an after action report. That is amazing, Omovic! Please let us know how New Year's Eve went. 2. On 31 December 2218, the TSN Hydra conducted a series of three simulated Combat Space Patrols in proximity to the Beta Lyrae singularity in order to evaluate an experimental fully centralised fly-by-wire system. 3. The systems under test proved reliable, but a bit delicate in their setup. 4. The bridge however crew, will face reprimands for being intoxicated on duty. This let to an inacceptable mission failure rate of 66%. The first simulation, a small scale assault of light forces, was initially succesfully countered, but ended apruptly when the TSN Hydra was destroyed by the defensive minefield of DS3 during controlled warp. 6. The final run, another full scale assault, ended with the accidental self-destuction of TSN Hydra by controlled Warp into two type 6 mines, deployed earlier. An preliminary investigation lead to helmsman intoxication as cause of both failures. All in all, our New Years Eve was quite fun for all participents in spite of my lamentable performance at the helm. We even planned another Artemis night for the weekend. I got to rig up my DMX multicolor spot and a wallwasher using an Enttec OPENDMX USB adapter. This worked well (after I loaded the correct DMXCommands.xmk instead of the stock file and discovered that only the first instance of Artemis SBS gets to control the DMX interface). I can not recommend my USB Audio dongles - they were dirt cheap, but all of produced considerable background noise all the time. I used the the 5 line-out jacks on my mainboard instead, connected to the built-in speakers of my Displays. While this made all stations play all sounds, it definitly gave the beepy-boopy ambience of Kirk's old bridge! Mines are a menace to many a helm officer, no less when intoxicants are added to the mix. Undoubtedly those missions will live on in story and song as have ours under similar circumstances.